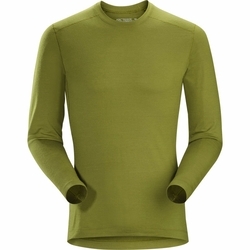 ARC'TERYX Satoro AR Crew LS Baselayer. A midweight Merino wool baselayer crew designed for prolonged all-round backcountry use, the Satoro AR leverages the advanced fabric technology of Nucliex STR 180 wool. Each Nucliex yarn is created by wrapping Merino fibers around a nylon filament to combine the natural comfort, efficiency and odor resistance of wool with the durability of the nylon core. Elastane fibers maintain the next-to-skin fit for maximum thermal efficiency and efficient moisture transfer.